How do I handle a change of plans? Yesterday, Jerry and I had planned to go out for supper. We usually do on Thursdays. I was in Meijer’s buying groceries. I knew I didn’t have to hurry home to fix supper. We were going out. As I went around an aisle I met my niece, Cathy. We stopped to chat. Our chat time became rather long! We seldom visit so we had lots to talk about and neither of us seemed to be in a hurry! We both listened to each other and we laughed a lot! I needed that! 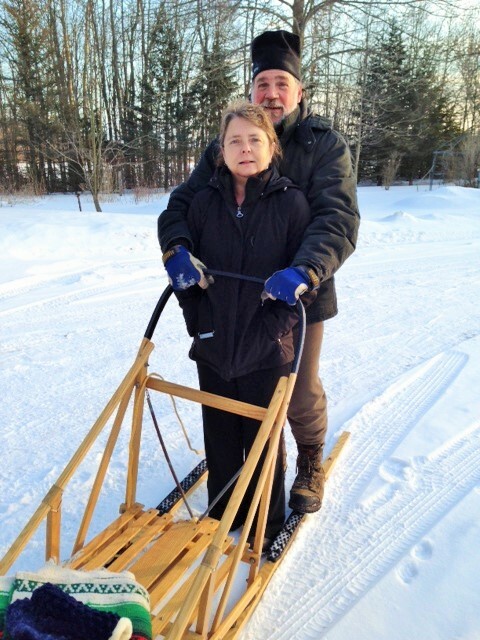 I wasn’t concerned about needing to go home to fix supper…we were going out! As I stood in the check-out lane waiting, I called Jerry to let him know I would be home soon. We were good to go! I finally got home, just in time to unload groceries and leave to go to Lanny’s, our favorite restaurant. But I was shocked when I walked in the back door! There, on my kitchen island, were two soup bowls of leftover scalloped potatoes with Polish sausage, waiting to be warmed in the microwave oven! What? What happened? I thought we were going out! Jerry stood there with a grin on his face! 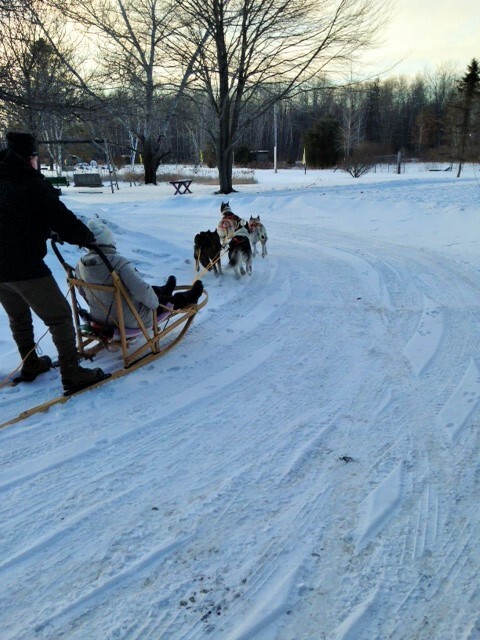 No question… I’ll go dog sledding! I’ve never gone before and it’s on my bucket list! My supper was put in the microwave as I unloaded the groceries. I ate quickly, dressed warmly and away I went! We’ll go out to eat another time. What a fun time I had! It was a perfect day for dog sledding. The sun was shining. The air was crisp and cold. No wind. I loved it! Even tipping over once didn’t dampen my spirits! This was a minor change of plans. What about a big change? Thirteen years ago I had plans to go to Thailand on a missions trip. It was my third time to go on this exciting adventure. I was ready! Four days before I was to leave, I fell on a patch of ice in our driveway and broke my wrist! My doctor, after surgery, to set my wrist and after putting a cast on from my shoulder down to my fingertips, said no to my trip to Thailand! “No.” He just looked at me, I need to see you next week he explained. “But, I’ve already got my ticket! I have to go…!” My doctor finally and reluctantly said I could go. So, off I went. It was the most difficult trip I’ve ever taken. I became very frustrated with my cast! I had to take showers with my arm in a plastic bag and tied above the cast! I had to have assistance with my bra! I had to write with my left hand! I cried so many tears of frustration. While I was in Thailand I became very sick with flu or something. Oh, I was so sick but I had to keep on with my responsibilities. I had only three kids in my class! Three! Was it worth all the money, the frustration, the time, etc. for three kids? Should I have listened to my doctor and stayed home? Was God closing the door to my trip to Thailand? But in my stubbornness I insisted on going? Someone mentioned the impact I may have had on those three preteens. I don’t know. Thailand is a long way away, I’ve never seen or heard from them again. Only eternity will tell. Change of plans. How do I accept it? How do you accept it? I love to travel! I’ve been to five continents, 14 countries and all 50 of the United States. I would love to go to many more countries… I have several countries on my bucket list, but I’m quickly aging. A few countries I’d love to go to are Norway, China, Ireland, Scotland and England, Nepal, Myanmar, Austria, Germany, France, Colombia, Rwanda, oh and so many more! The continents I’ve been to are: South America, Europe, Asia, Africa and North America. The countries I’ve been to are: Haiti, Paraguay, Brazil, Mexico, Canada, U.S.A., The Netherlands, Belgium, Israel, Egypt, Jordan, Thailand, Japan and Malaysia. 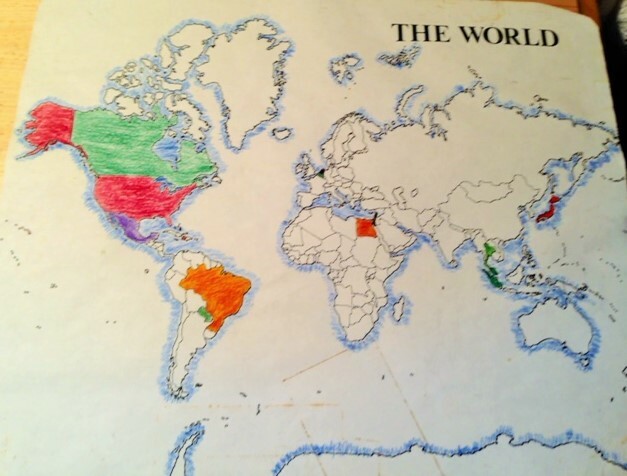 It’s hard to see some of the countries, but I’ve colored each one I’ve been to. For many years, I was an ESL (English as a Second Language) tutor. I had students from all over the world, from ages three to 70! I loved every one of them and I believe they loved me! They came from Brazil, Argentina, Colombia, Korea, Japan, China, Taiwan, Egypt, The Netherlands, Germany, Switzerland, Thailand, Italy and Spain. I have probably missed some countries here. I’m amazed! As I check my statistics I have readers from all over the world! U.S.A., Norway, Czech Republic, Venezuela, The Netherlands, Brazil, Algeria, Australia, Russian Federation, Canada and more that I’ve missed! I’m thrilled! For God so loved the world, that he gave his only begotten Son, that whosoever believes in him should not perish, but have everlasting life. John 3:16. I believe God is Omnipresent and God is Love.